Late one night while relaxing on the couch I caught the movie Hotel Rwanda on television by chance. I had never seen it before, although always having been keen to do so, and felt that this was the sign I needed to know that this trip was meant to be. It was surely a sign, in my min d, that I should travel to the heart of Africa and learn more about what Rwanda has to offer. So, while I waited to learn where the group would be staying, I held out hope that it’d be at the actual hotel, the Hotel des Mille Collines. Sadly, this part of it was not meant to be as we were instead housed in a hotel that, as I said previously, made me yearn for a night at a Motel 6. But, more on that in another post. 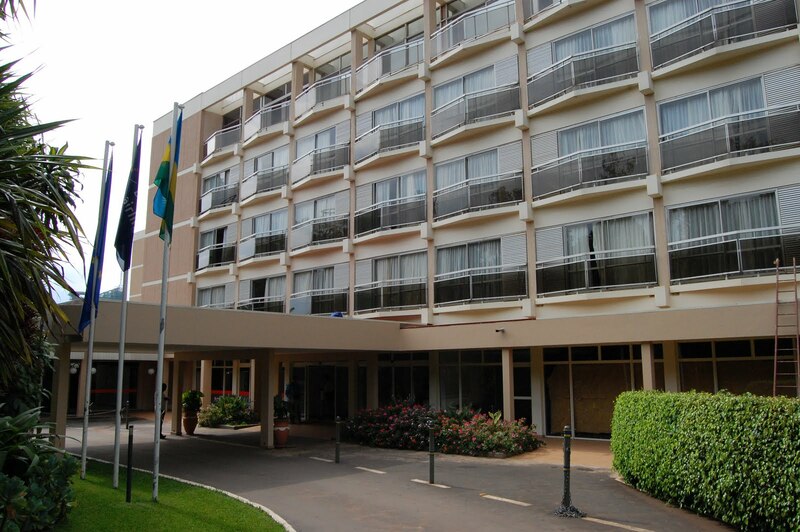 A trip to the Hotel des Mille Collines, or the Hotel of a Thousand Hills – for which the country is nicknamed – was not originally on our itinerary, but we were able to fit in a quick stop on our way out of Kigali to Ruhengeri since we needed to stop at a nearby bank anyway. Our visit was brief, not even long enough to sip a beer at the poolside bar, but it made a huge impression on me since I had so recently seen the film. I was awash with emotion, especially after having just seen the genocide memorial hours earlier, as I imagined the events that transpired in the movie happening right before my eyes. It was an emotionally overwhelming visit, but one that I was pleased we had the brief opportunity to do. And while I’m sure the hotel staff, who has to see it daily, doesn’t appreciate tourists coming in to snap photos of their hotel because of the movie, I feel it necessary for any visitor to the country to see the movie and the location where it all happened. Sadly though, there’s no mention anywhere in the hotel of the events that transpired in 1994; I can appreciate that they want to move on, but it seems only right to recognize what happened in the past. Regardless, as we left the hotel to head west for our encounters with the gorillas, I couldn’t help but feel a great disappointment at our not having stayed there. It would’ve been great to experience the hotel for longer than the 30 minutes possible. It has such an amazing story to tell and I’m not sure it can properly be appreciated in such a short amount of time. But hey, at least I was able to meet Don Cheadle, the main actor from the film, later on the trip.